Since September 2016, some Boston officers have been wearing body cameras as part of a program to test their usefulness in sorting out events during police-citizen interactions. The gang unit officer had testified under oath that the defendant, a 19-year-old from Dorchester, had been behaving suspiciously, looked nervous, and never took his hand off the car’s center console, leading the officer to frisk him during a traffic stop in March 2017. But Boston Municipal Court Associate Justice Catherine K. Byrne had a different interpretation of what happened. She could see the interaction for herself, on a police body camera footage that was introduced in court. “I do not credit the testimony,” Byrne said in a 10-page order that led to the case’s dismissal. As city officials await a final assessment of the yearlong body camera pilot program in Boston, civil rights advocates point to three court cases that were overturned based on body camera footage as evidence of the program’s success. And even many police officers, some initially hesitant to participate in the body camera pilot, say they now see the value in recording interactions with civilians, particularly after an internal affairs investigation was dismissed due to body camera footage that justified the officer’s actions. “The department, although a little reluctant to jump in at first, has seen that it protects their members well,” Commissioner William Evans recently told City Council members. At least three criminal cases, all involving illegal guns, were dismissed based on body camera footage from the pilot program, which began in September 2016, according to records compiled by the American Civil Liberties Union of Massachusetts and shared with the Globe. Lawyers with the ACLU say that new technology such as body camera footage or dash cameras could prove vital in resolving disputed court cases. The lawyers said they have also seen video footage that seemed to support police actions, even while a defendant was objecting to an officer’s actions in the video. The ACLU recently urged court officials in a letter to “start reviewing police testimony that doesn’t come with body camera footage [from the pilot program] with more skepticism,” Crawford said. There is no known accounting of the number of court cases that have included body camera evidence in Massachusetts. Even in cases when there is video footage, defense attorneys have been hesitant to use it in court when the footage implicates their defendants. Boston police said recently that officers compiled 38,200 videos, or 4,600 hours of footage, during the one-year pilot program. In that program, 100 cameras were attached to patrol officers and to gang unit officers across the city. Prosecutors support the cameras, too, noting the value of the footage. 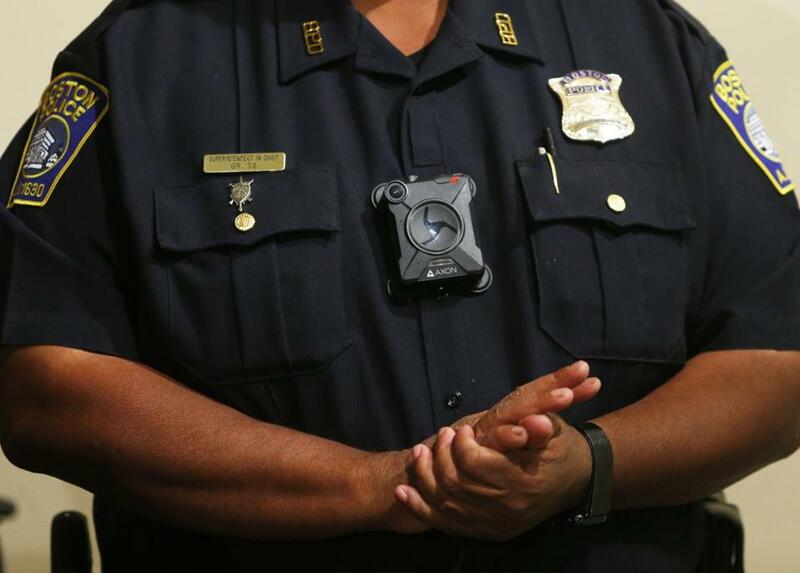 The review of the court cases comes as Mayor Martin J. Walsh has signaled a new willingness to implement a body camera program in Boston, after years of debate and a pilot program. The mayor recently committed to funding a camera program in the next budget cycle, though he would not say what the program would look like: That depends largely, he said, on the findings of the final report on the pilot program, expected by June. An initial review found a slight drop in complaints against police officers who wore the body cameras, though the final report is also expected to examine whether officers who wore cameras interacted differently with civilians. During the pilot program, Evans said, Boston did not see any significant change in arrests, the number of complaints against officers, or officers’ reported use of excessive force as seen in studies in other cities that implemented pilot programs, because the city already had a relatively low rate of citizen complaints against officers. And that number keeps dropping: The city received 360 citizen complaints in 2013, compared to 211 last year. The department reported 80 incidents of officer use of excessive force in 2011, compared to 21 in 2017. There seems to be a newfound appreciation for the cameras, and police say they could implement the program citywide by the end of the year. The immediate implementation costs could range from $5 million to $7 million, and cost $25 million over five years, officials said. City Council President Andrea Campbell, who advocated for body cameras when she first took office two years ago, said the city could implement the program in phases. She also said the city should go further and consider new technology, including the possibility of implementing drones, or cameras on Taser weapons, in their police work. “Recent incidents only go to confirm that body cameras can serve as accountability, not only for officers but the community as well,” she said during a council hearing last week. Civil rights advocates say the cameras will not only prove useful in monitoring police interactions with civilians, but also in monitoring the constitutionality of arrests that they do believe are justified. In recent cases viewed by the Globe, the cameras were introduced as evidence by defendants, including in cases in which police gang unit officers confiscated unlicensed guns. “The video from the body-cam . . . was extremely helpful to the court, in ruling on defendants’ motion,” Byrne, the judge, wrote in agreeing to dismiss proof of an unlicensed gun in a case in October 2017. In that case, the judge said the video’s portrayal of “the events as they unfolded” confirmed the defense lawyers’ constitutional claims of privacy. The lawyers argued police had no cause to frisk two black men who were seen sitting in a parked car in Dorchester and to search their car, in spite of the officers’ suspicion that the car was parked a block away from the scene of a shooting moments earlier. The men did not live on the street, the officers noted. One of them had clothes matching the description of a suspect. The judge said that did not matter. “It was unreasonable and unjustified to detain them . . . which is exactly what happened,” the judge said.